The aim of this prestudy is to verify and demonstrate the possibility to industrially implement a novel technique to radically make the casting of steel and ductile iron more effective with respect to output and sustainability aspects. The technique uses inductional heating to control and enhance the feeding of melt into the mould. Traditionally, the yield at steel casting is very low since the feeders themselves contribute with up to half of the casting weight. Trials with bronze castings indicate that the feeder volume might be reduced by 90% through induction heating, leading to a radical decrease of material and energy consumption during melting. The technique is to date untested for iron and steel and not custom to industrial use. Therefore, there is a large potential for Swedish foundry industry to pioneer if the prestudy is successful and the technique can be upscaled to large-scale production. 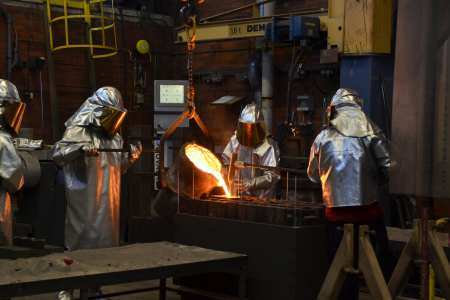 This might change the established truth about the casting of iron and steel, increase the competitiveness of Swedish foundries, and reduce their carbon footprint. The long-term vision is to develop feeder-free casting as an international invention. Swedish foundries which ensures a good basis for future implementation and spread of the new technique.